Developers will be able to access information from the site’s user network to add LinkedIn features to their own websites. For instance, BusinessWeek has added a new feature to its website to show how LinkedIn connects readers to people and companies it has written about in its articles. Developers are able to write business-orientated applications for use on the company’s website. LinkedIn will be supporting Google’s OpenSocial platform for this purpose. User profile pages can also now be customised, and modules can be added or removed. LinkedIn has also simplified navigation, with just five buttons at the top of the homepage instead of the previous ten. LinkedIn has increased its user numbers rapidly this year, and grew faster than Facebook in October. It now has around 17m registered users, 5m of which are in the US. This is an interesting move for the network – the new modules add value to the site for users, while allowing LinkedIn to be integrated into applications on third-party sites could be a very effective way of increasing its reach. The average age of UK internet users is on the rise, thanks to the growing online presence of the over-55s, or ‘silver surfers’. This is the finding from Nielsen Online’s latest study (pdf). While the under-25’s share of the UK internet population has fallen from 29% to 25%, silver surfers’ share has increased from 16% to 19%. Social recommendation service MyStrands has bagged another $25m in financing to expand into new markets, such as shopping. The funding, adding to the $24m it raised just six months ago, was led by Spanish bank BBVA and previous investor Debaeque. MyStrands has now raised $55m in total, so why does it need all this cash? 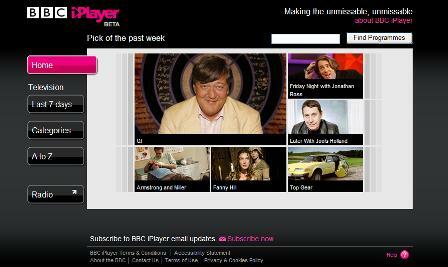 The BBC last week made a streaming version of its iPlayer available for the Windows, Mac and Linux platforms.